One of the most obvious perceived contradictions between Bible and science is the age of the universe. Is it billions of years old, like scientific data, or is it thousands of years, like biblical data? When we add up the generations of the Bible and then add the secular rulers that followed, we come to fewer than 6000 years. Whereas, data from the Hubbell space telescope or from the land based telescopes in Hawaii, indicate the number at 14 billion years. In trying to resolve this apparent conflict, I use only ancient biblical commentary because modern commentary already knows modern science, and so it is influenced by what science always. That commentary includes the text of the Bible itself (3300 years ago), the translation of the into Aramaic by Onkelos (100 CE), the Talmud (redacted about the year 400 CE), and the three major biblical commentators on the Hebrew text. There are many, many commentators, but at the top of the mountain there are three: Rashi (11th century France), who brings the straight understanding of the text, Maimonides (12th century Egypt), who discusses philosophical concepts, and Nahmanides (13th century Spain), the most important of the commentators who deal with the spiritual physics of the universe, often referred to as Kabala. These ancient commentaries were finalized hundreds or thousands of years ago, long before Hubbell was a gleam in his great-grandparent’s eye. So there’s no possibility of Hubbell or any other scientific data influencing these concepts. That’s a key component in keeping the following discussion objective. That was 1959. In 1965, Arno Penzias and Robert Wilson discovered the echo of the Big Bang in the black of the sky at night, and the world paradigm changed from a universe that was eternal to a universe that had a beginning. Science had made an enormous paradigm change in its understanding of the world. Understand the impact. Science has confirmed to the best of scientific ability that our universe had a beginning. I can’t overestimate the import of that scientific “discovery.” Evolution, cave men, these are all trivial problems compared to the fact that we now understand that our universe had a beginning. Exactly as the Bible had claimed for three millennia. Of course, the fact that there was a beginning, a creation, does not prove that the Biblical God was the Creator. Whether that is true, that “God created the Heavens and the Earth (Genesis 1:1),” is still being debated. Physics allows for a beginning without a beginner. I’m not going to get into the physics of that here. “The Science of God,” my second book, examines this in great detail. In brief, in 1973 Professor Ed Tryon published in the prestigious peer reviewed journal Nature, a article demonstrating that as per the laws of physics, the universe could be created from absolute nothing via a quantum fluctuation. According to this understanding, there was only one physical creation. All the energy / matter and all space come into being as a minuscule speck from absolute nothing. The universe expanded out from that speck of space not by having new space added on, but by the original space stretching. In doing so, the huge concentration of energy of the Big Bang creation became more dilute within the ever stretching space, and so the temperature of space decreased. The question we’re left with is, how long ago did the Big Bang creation occur? Was it, as the Bible might imply, fewer than 6,000 years, or was it the 14 billions of years that are accepted by the scientific community? The first thing we have to understand is the origin of the biblical calendar. The biblical calendar age of the universe is calculated by adding up the generations since Adam. This reaches a number slightly under 6000 years. Additionally, there are six days (actually the biblical text gives 5 and a half days) from the creation of the universe to the creation of the first human, that is the first being with the soul of a human (not the first hominid, a being with human shape and intelligence, but lacking the soul of humanity, the neshama). We have a calendar that begins with Adam. The six pre-Adam days are separate from this. The Bible has two calendars, two clocks. This is no modern rationalization. The Talmud already discussed this 1600 years ago. The reason the six pre-Adam days (Genesis 1:1 – 27) were taken out of the calendar is because time is described differently in those Six Days of Genesis. There the passage of each day is described as “There was evening and morning” with no relationship to human time. Once we come to the progeny of Adam, the flow of time is totally in human terms. Adam and Eve live 130 years before having Seth. Seth lives 105 years before having Enosh, etc. (Genesis chapter 5). From Adam forward, the flow of time is totally human-based, earth -based. But prior to that time, it’s an abstract concept: “Evening and morning.” It’s as if the Bible is looking at those events of Genesis One from a viewpoint other than the earth, a cosmic view of time. What might be the Biblical perception of the timing of those events prior to Adam relative to our earth-based measurements? In trying to understand the flow of time here, you have to remember that the entire Six Days is described in 31 sentences. The Six Days of Genesis, which have given people so many headaches, are confined to 31 sentences! At MIT, in the Hayden library, we had about 50,000 books that deal with the development of the universe: cosmology, chemistry, thermodynamics, paleontology, archaeology, the high-energy physics of creation. Up the river at Harvard, at the Weidner library, they probably have 100,000 books on these same topics. The Bible gives us 31 sentences. Don’t expect that by a simple reading of those sentences, you’ll know every detail that is held within the text. It’s obvious that we have to dig deeper to get the information out. The usual answer to that question is let the word ‘day’ in Genesis chapter one be any long period of time. Bend the Bible to match the science. Fortunately, the Talmud in Hagigah (12A), Rashi there and Nahmanides (Gen. 1:3) all tell us that the word day means 24 hours, not sunrise and sun set. The sun is not mentioned till day four and these commentaries all relate to all six days, starting from day one. But the commentary continues in Exodus and Leviticus, that the days are 24 hours each (again, not relating to sunrise and sunset, merely sets of 24 hours). There are six of them, and their duration is not longer than the six days of our work week, BUT, the commentary continues, they contain all the ages of the world. How can six 24 hour days contain all the ages of the world? At the end of each day of the six creation days, the day is numbered. Yet Nahmanides points out that there is discontinuity in the way the days are numbered. At the end of the first day, the verse says: “There is evening and morning, Day One.” But the second day doesn’t say “evening and morning, Day Two.” Rather, it says “evening and morning, a second day.” And the Bible continues with this pattern: “Evening and morning, a third day… a fourth day… a fifth day… the sixth day.” Only on the first day does the text use a different form: not “first day,” but “Day One” (“Yom Echad”). Many English translations make the mistake of writing “a first day.” That’s because editors want things to be nice and consistent. But they throw out the cosmic message in the text! That message, as Nahmanides points out, is that there is a qualitative difference between “one” and “first.” One is absolute; first is comparative. The Bible, he tell us, could not write “a first day” on the first day because there had not yet been a second day relative to it. Had the perspective of the Bible for the first six days been from Sinai looking back, the Bible would have written a first day. By the time the Torah was given on Sinai there had been hundreds of thousands of “second days.” The perspective of the Bible for the six days of Genesis is from the only time in the history of time when there had not been a second day. And that is the first day. From the creation of the universe to the creation of the soul of Adam (Genesis 1:27), the Bible views time from near the beginning of the universe looking forward. At the creation of Adam and Eve, the soul of humanity, the Bible perspective switches from this cosmic view of time to earth based time. From that point on, all biblical descriptions of time are human-based, earth-based, the space-time coordinates by which we live. We look at the universe, and say, “How old is the universe? Looking back in time, the universe is approximately 14 billion years old.” That’s our view of time and those years went by. But what is the Bible’s view of those billions of years looking forward from the beginning? How does it see time? Nahmanides taught that although the days of Genesis One are 24 hours each, they contain “kol yemot ha-olam” – all the ages and all the secrets of the world. Nahmanides says that before the universe, there was nothing… but then suddenly the entire creation appeared as a minuscule speck. He gives a description for the speck: something very tiny, smaller than a grain of mustard. And he says that this is the only physical creation. There was no other physical creation; all other creations mentioned in Genesis One were spiritual: the Nefesh (the soul of animal life, Genesis 1:21) and the Neshama (the soul of human life, Genesis 1:27) are spiritual creations. There’s only one physical creation, and that creation was a tiny speck. In that speck was all the raw material that would be used for making everything else. Nahmanides describes the essence of that first material as “dak me’od, ein bo mamash” – so very thin, no substance to it. And as this speck expanded out, this essence, so thin that it had no material substance, turned into matter as we know it. Nahmanides further writes: “Misheyesh, yitfos bo zman” – from the moment that matter formed from this substance-less substance, time grabs hold. Time is created at the beginning. But biblical time “grabs hold” when matter condenses from the substance-less substance of the big bang creation. When matter condenses, congeals, coalesces, out of this substance so thin it has no material substance, that’s when the biblical clock starts. Science has shown that there’s only one “substance-less substance” that can change into matter. And that’s energy. Einstein’s famous equation, E=MC2, tells us that energy can change form and take on the form of matter. And once it changes into matter, biblical time grabs hold; the biblical clock begins. Energy – light beams, radio waves, gamma rays, x-rays – all travel at the speed of light, 300 million meters per second. At the speed of light, time does not pass. The universe was aging, time was passing, but until there was stable matter, nothing was present recording that passage of time. Time only grabs hold when stable matter is present. This moment of time before the clock of the Bible begins lasted less than 1/100,000 of a second. A miniscule time. But in that time, the universe expanded from a tiny speck, to about the size of the Solar System. From that moment on we have matter, and biblical time flows forward. The biblical clock begins here. Now the fact that the Bible tells us there is “evening and morning Day One”, comes to teach us that the biblical calendar begins from near the beginning looking forward. We look back in time, and measure of the universe to be 14 billion years old. But as every scientist knows, when we say the universe is 14 billion years old, there’s another half of the sentence that we rarely bother to state. The universe is 14 billion years old as measured from the time-space coordinates of the earth, that is, from our current position in the universe. The key is that from the creation of the universe to the creation of the soul of Adam, the Bible looks forward in time, from time-space coordinates when the universe was vastly smaller than it is today. Since then, the universe has expanded out. Space stretches, and that stretching of space totally changes the perception of time. Light travels 300 million meters per second. So at the beginning, when the light pulses are first released, the two light pulses are separated by a second of light travel time or 300 million meters. The pulses of light travel through space for billions of years until they reach the Earth. But wait. Is the universe static? No. The universe is expanding. The universe expands by space stretching. So as these pulses travel through space for billions of years, the space between them is stretching. The pulses get further and further apart. Billions of years later, when the first pulse arrives, we read on it “I’m sending you a pulse every second.” A message from outer space! You wait for the next pulse to arrive. Does it arrive second later? No! A year later? Maybe not. Maybe billions of years later. Because the amount of time that these pulses of light have traveled through space will determine the amount that space stretched between them. That in turn will determine how much time there will be between the arrivals of the pulses. This is standard astronomy. Einstein, in the laws of relativity, taught the world that time passes at different rates in different environments. Absolute time does not exist in our universe. The passage of time is relative. In regions of high velocity or high gravity time actually passes more slowly relative to regions of lower gravity or lower velocity. (One location relative to another, hence the name, the laws of relativity) This is now proven fact. Time actually stretches out. Where ever you are time is normal for you because your biology is part of that local system. Note that the above discussion does not relate to these laws of relativity. It relates to a very different phenomenon, the effect of the stretching of space on the perception of the passage of time. That God might have used the laws of nature to create the universe is fully consistent in relationship to the Biblical accounts of God’s actions. The only name for God in the creation chapter, Genesis chapter one, is Elokim, God as made manifest in nature. Maimonides in his monumental Guide for the Perplexed (1190; part 2, chapter 6)) wrote that God at times uses the forces of nature to accomplish God’s goal. An example of God using nature to accomplish a goal is in the Exodus account. After our leaving Egypt, God led us to the banks of the Sea of Reeds (or the Red Sea depending upon translations; see the First book of Kings chapter 9 verse 26 for the location of the Sea of Reeds.). There trapped by the sea, God saves us from the pursuing Egyptian army by splitting the sea with a strong east wind that blew all night (Exodus 14:21). That detailed description of the wind was given to let us realize that the wind may have seemed natural. How natural? After the Israelites pass through the opened sea, the pursuing Egyptian soldiers follow right on in. After all it is just a lucky wind. (See D. Nof and N. Paldor; Are there oceanographic explanations for the Israelites crossing of the Red Sea? ; published in the esteemed, peer-reviewed scientific journal The Bulletin of the American Meteorological Society, Vol. 73; no. 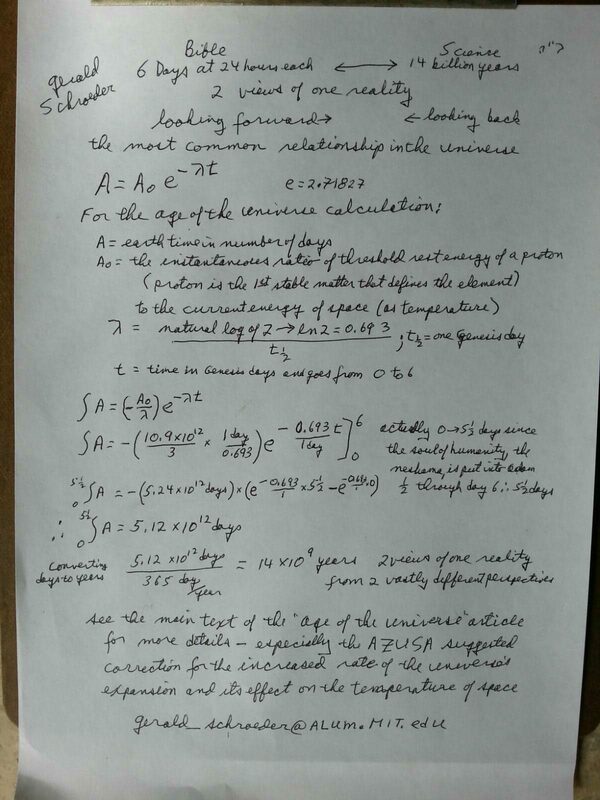 3; March 1992, for a peer-reviewed account of the possibility of the wind actually opening the sea.) If the wind had seemed super-natural, the army would have fled back home. So natural-seeming was the wind that the Bible had to tell us that it was God that made the wind blow at that time. So we see that the laws of nature instilled by God at the creation are a part of God’s tools in this world, and also for creating this magnificent world in which we dwell.